Posts categorized "News & Celebrities"
Today, I am delighted to welcome Dr. E. David Crawford, Chairman of the Prostate Conditions Education Council, with a guest post on how a new 3-D imaging procedure is helping patients choose the right prostate cancer treatment option. Guy H., a real estate agent and steer roping enthusiast from Texas, had Transrectal Ultrasound (TRUS) guided needle biopsies to determine if he had prostate cancer. Unfortunately results of the TRUS showed that he did, but the needle samples taken only provide estimates on the tumor’s grade and extent, which is used to classify abnormal cancer cells and how quickly they are likely to grow and spread. Like many patients, Guy was concerned about choosing a treatment method that was too conservative, risking the future spread of cancer. Yet choosing a method that was too aggressive might have put his health at risk due to possible over-treatment. It is a common problem for men diagnosed with prostate cancer and a fine line that patients and doctors walk as they compare watchful waiting to more invasive options, like radiation or prostatectomy. Because of the risks associated with radiation or prostatectomy, such as urinary incontinence, impotence and other quality of life issues, Guy wanted to access all of his options. Fortunately new technology is providing higher-quality images of the prostate, helping to improve prostate cancer treatment decisions. Guy visited the University of Colorado where I was conducting research into a technology that can provide men with a more accurate picture of their prostate cancer diagnosis – the Transperineal 3-D Mapping Biopsy. Another great actor, Harold Gould, has died of prostate cancer. He was one of Hollywood's more prominent stars, having co-starred with the late, great Paul Newman and others in numerous feature films and TV sitcoms. President Barack Obama recently signed a proclamation declaring September as National Prostate Cancer Awareness Month, and it's the perfect time to increase public awareness of prostate cancer, focus on prevention, remind men about the importance of early screening, and support patients, survivors and their families. 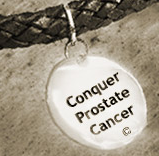 "Conquer Prostate Cancer" wristbands are now available from Us TOO International Prostate Cancer Education and Support Network, the oldest and largest non-profit peer support organization dedicated to assisting men and their families battle a prostate cancer diagnosis. Us Too has recently announced a “Conquer Prostate Cancer” public awareness and fundraising campaign, featuring the wristband, created by fashion designer and cancer survivor Joseph Bruno. Fashioned from genuine black braided leather, the wristband can be adjusted to fit any size wrist and is detailed with a non-tarnish silver-finish medallion marked with the blue ribbon symbolizing the fight against prostate cancer. The wristband is available for $25 with all net proceeds going to Us TOO, International. Prostate Cancer Celebrities: Louis Gossett, Jr.
Prostate cancer is an illness experienced by many actors. Many of them have been increasingly willing to publicly divulge that part of their private lives. An example is Louis Gossett, Jr. He is a leading American actor, best known for his Oscar-winning role as a tough drill sergeant in "An Officer and a Gentleman." He is just one of several Hollywood "greats" who was recently diagnosed and treated for this disease, in his case at the age of 73.